Historical records state that the city of Mumbai comprising of seven islands had human settlements right from the Stone age period. The first official mention of Mumbai was made by the Egyptian Geography scholar Tomly in the year A.D 150. During the Satvahana era there was an existent foreign trade from Mumbai. During the 5th and 6th century the Mauryas ruled this city and had their capital at Gharapuri i.e. the Elephanta island near Mumbai. After thet Mauryas, Chalukyas, Rashtrakuts, Shilahar, Yadavs ruled this region. In the year 1140, king Pratapbimb of Gurajat province defeated the Shilahars and established his capital at Mahikavti which is currently known as Mahim in Mumbai. Sultan Mubarak Shah of Gujarat won Mumbai in 1320 and the last Sultan of Gujarat, Bahadurshah handed over Mumbai, Sashti islands and Vasai islands to the Portuguese as per the pact of 1534. When Prince Chales II of England married the royal daughter of Portuguese Ms. Braganz in 1662, the Portuguese gifted Mumbai islands to the British. A total of 11 forts were built in Mumbai viz; Bandra, Mahim, Worli, kala killa, Rewa, Sion, Sewri, Mazgaon, Dongri, St. George and Bombay fort. Bombay fort, Mazgaon and Dongri forts are non-existent today. To protect the eastern sea front of Mumbai the forts of St. George, Dongri, Mazgaon, Sewri were built. Bahadur khan built the shrine near the main door under his regime. When the Portuguese took over the fort as per the pact of 1534 they refurbished the entire place. After the Siddi of Janjira attacked Mumbai, the British rulers strengthened all the existing forts in Mumbai and also added some new forts. This fort which vests in the Eastern part of the Parel island was refurbished and strengthened by the British in the year 1680. When the Siddi of Janjira, Yakut Khan attacked Mumbai he captured the forts of Sewri, Mazgaon and Mahim. At that time there were around 50 soldiers, 1 subhedar and 10 canons on Sewri fort. This fort was used for many purposes. In the earlier times it served as a watch tower for guarding the trade between Panvel, Uran, Thane and Gharapuri region. After that the British used it as a prison and later the Bombay Port Trust made its warehouse here. This fort still stands in a good condition due to regular maintenance by the Archaeological Society of India. 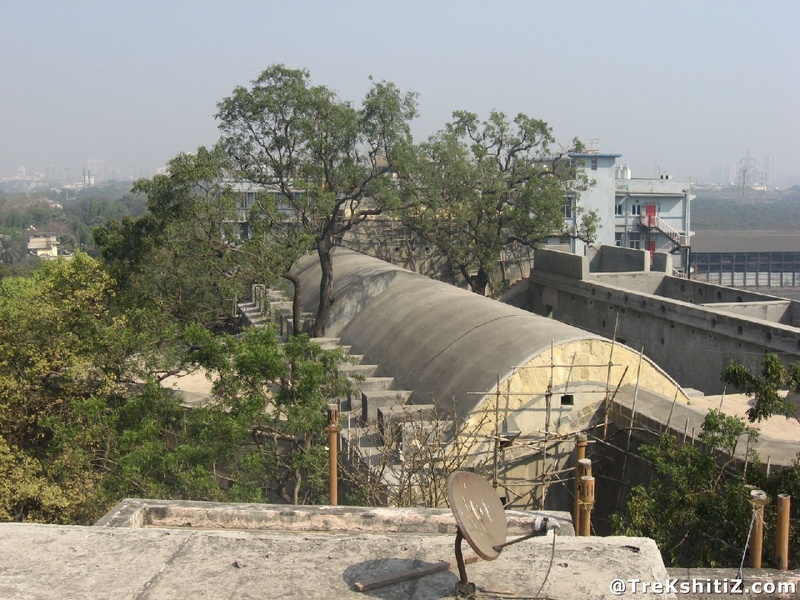 The approach steps of the fort take us to the shrine of Sayyed Jalal Shah. Once entering the main door we come across two structures with semi circled roofs. These were used as prisons and warehouse. The bastions of the fort are in a triangle shape. One can climb the fort wall by the steps built in it. Sewri fort is located to the west side of Sewri railway station on the Harbour railway route of Mumbai. Hop out of the platform no 2 of Sewri station and head towards Colgate Palmolive Company. This route will take you to the base of the fort in about 10 minutes. There are proper steps built for access to the fort. The backdrop of the fort to the sea side which is a marshy land tends to be a paradise for Flamingo and other migratory birds. December to April is the peak season when these migratory birds arrive here.